Horst Maier-Thorn grabó el debut de Bonfire, Don’t Touch The Light (1986), y Fireworks (1987). "Estamos muy tristes de anunciar que nuestro amigo y músico de Bonfire Horst Maier-Thorn murió el pasado fin de semana. Descansa en paz Horst"
We are really sad to announce that our long time fellow und Bonfire Musician Horst Maier-Thorn died last weekend. Rest in peace Horst. "... Horst fue un gran músico, colega y amigo que tuvo que renunciar a Bonfire demasiado pronto, debido a su enfermedad reumática... Desafortunadamente, la enfermedad ahora dió lugar a su prematura muerte... en recuerdo de Horst Maier-Thorn... Hans, Frank, Ronnie, alexx, Tim." 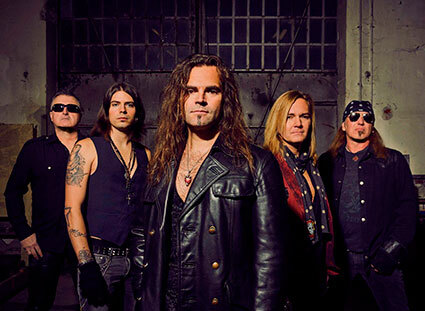 BONFIRE, detalles de su nuevo disco "Byte The Bullet"
Bonfire anuncian su fichaje por la discográfica AFM Records y que lanzarán un nuevo disco en la primavera de 2018. 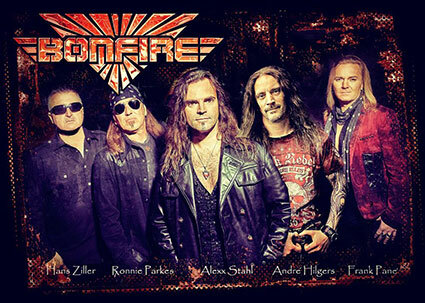 Bonfire​ sign with AFM Records! 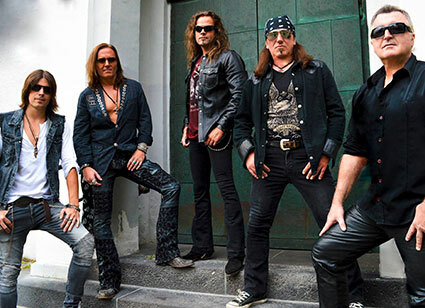 BONFIRE: detalles de su nuevo disco "Temple Of Lies"
Bonfire lanzará su nuevo álbum, "Temple Of Lies", el 13 de abril a través de AFM Records. 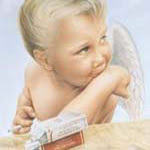 "Temple Of Lies" fue producido por Hans Ziller en los estudios "Flatliners Recording" en Ingolstadt. 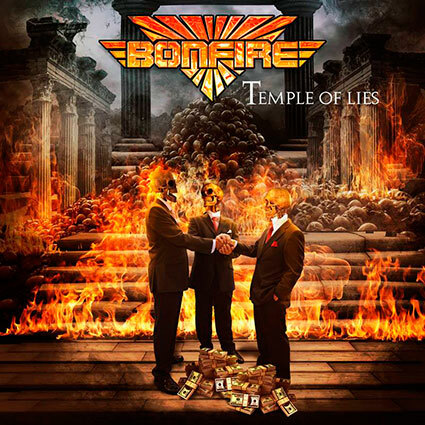 Bonfire to release new album "Temple Of Lies" on April 13th! It’s not only the occasionally tougher pace that impresses on Temple Of Lies (produced by Hans Ziller at the Flatliners Recording Studios in Ingolstadt) from the first to the very last note, but also the album’s diverse high-quality songwriting in general. Driving midtempo tracks (‘Feed The Fire’, ‘On The Wings Of An Angel’, ‘Fly Away’, ‘Crazy Over You’) support the afore-mentioned uptempo rock numbers and are expertly broken up by the ballad ‘Comin` Home’ and ‘I Help You Hate Me’, which surprises with a reggae groove verse. Temple Of Lies kicks off with the intro ‘In The Beginning’, featuring American voice actor David Michael Williamson (Lord of the Rings). So the fun factor is back in the Bonfire camp, manifesting itself also in the 20-minute bonus track ‘Friedensreich II. – The Return Of The Zünsler Into The T.O.L.’, a humorous sound collage which frequently brings to mind Frank Zappa. The programmatic album title and expressive cover artwork prove that Ziller & Co also live up to their responsibility as socially aware musicians, taking to task “the lies of our world and politicians”. No doubt about it: Temple Of Lies sees Bonfire live up not only to their own history. 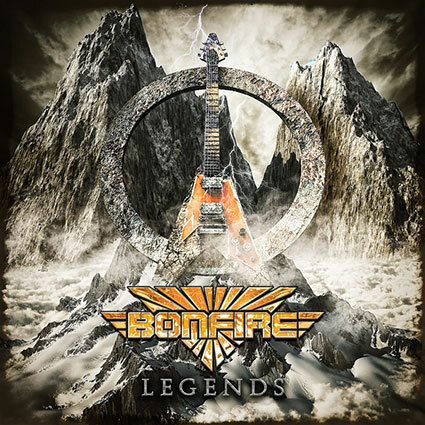 BONFIRE: nuevo tema "Crazy Over You"
Bonfire lanzará un nuevo disco de versiones titulado "Legends", el 19 de octubre de 2018. BONFIRE: nuevo tema "Eye Of The Tiger"
Después de 3 años y 4 álbumes, Tim Breideband deja Bonfire para centrarse en otros proyectos, como siempre la banda le desea lo mejor. Será sustituido por André Hilgers (Rage, Silent Force, Axxis y Sinner). André actuará con Bonfire por primera vez el 01-03-2019 en Memmingen en Kamminwerk. Official announcement: after 3 years and 4 albums Bonfire and Tim Breideband will be parting ways and Tim will be pursuing new opportunities. Tim is an excellent drummer and was a great addition to Bonfire. We are sure he will be great in his future endeavors and we wish him the very best. Bonfire would like to announce our new drummer André Hilgers. André is an excellent and very accomplished drummer, formerly with Rage, Silent Force, Axxis and Sinner. We would like to welcome André to the Bonfire family and we are looking forward to what this new relationship will bring for Bonfire. You can see André perform with Bonfire for the first time 01.03.2019 in Memmingen at Kamminwerk.